Below is the continuation of our 15 best early development toys every baby should have list. There’s never a boring moment with this motion sensor activated exploration cube as soon as your baby sets their hands on it. 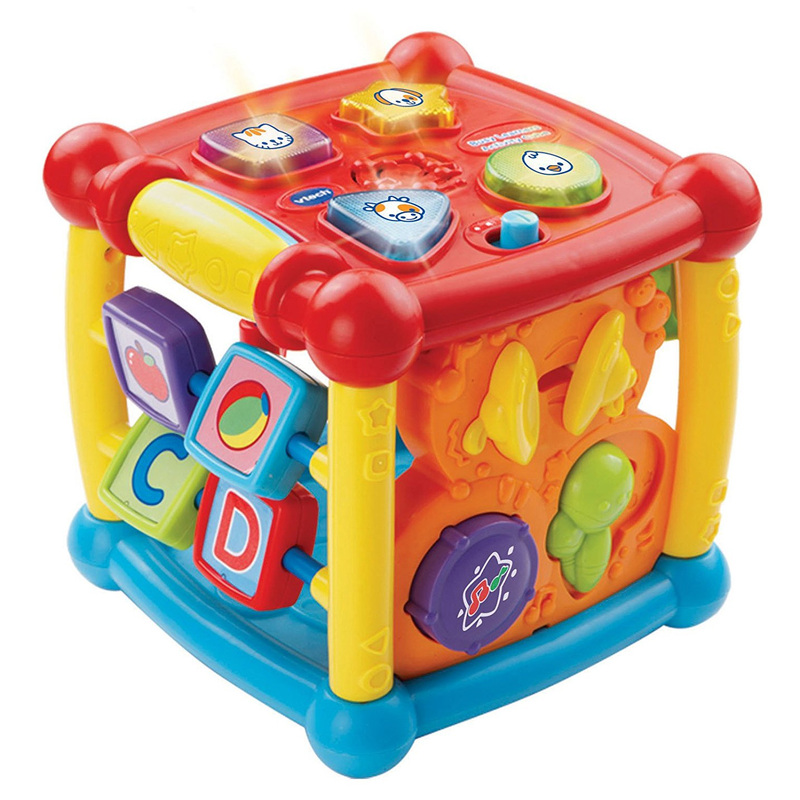 With 14 interactive features that encourages motor skills development and 25 playful songs and melodies for your baby to learn and enjoy, there is no doubt that your little one will be busy exploring all that this learning cube has to offer. Watch your child become mesmerized by the colorful light patterns while listening to soothing classical music from Mozart, Chopin, Vivaldi, and other masters. With volume control included, this drool-proof “baby boom” box is easy for infants who are still working on their hand coordination to hang onto it. Keep your baby fully entertained with this kicker of a play set. Your baby will enjoy getting rewarded with music every time he or she kicks the piano keys. With a variety of sounds, sights, and textures within your baby’s grasp and vision, expect your precious little one to become fascinated with this engaging classic playset. This colorful toy simply offers an outstanding plethora of sensory stimulation options for your baby. From clacking rings and fun jingle sounds to its various combinations of colors and textures, expect your baby to find different ways of getting entertained with this truly unique firefly toy. This also comes with a teething berry and a plastic mirror that will fascinate your little one especially when they see their reflection on it. One of the classic developmental toys ever invented, these 8 brightly colored stackable cups will always keep a baby busy. The bottoms are numbered and have different shaped small holes (star, square, triangles, etc.) for water play. These cups can also be stacked upside down to create a little tower. This is a great toy for developing motor skills and logical thinking. So go ahead. Let your baby learn and develop while they play and have fun with any of the above highly rated early development toys. Nothing compares to watching the joy in your baby’s face when they play with their new favorite learning toy. It’s really worth it.